Join the discussion on our forums! 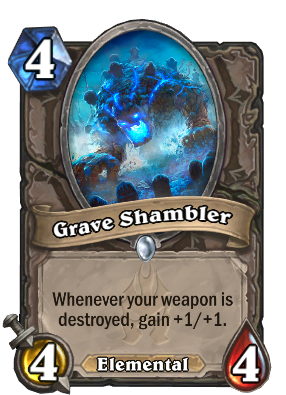 Come discuss Grave Shambler over in our dedicated Grave Shambler discussion topic. What the f...? It's been month and a half and i've just found out this card for the first time. I don't remember opening it, i don't remember playing against it. So trippy. Why would it? The weapon isn't destroyed. It does remove it but i'm pretty sure it deosn't count as breaking it since it returns to your hand. Seriously, what'll be next? 4 mana x/y ,+1/+1 for every spell you try to cast but gets countered, or maybe for each of your secrets eaten? Expect for the obvious synergy with the rouge hero power, If you are a low-budget pirate warrior and your hand is flooded with N'Zoth's First Mate and weapons.. you could buff it with them.. even +3/+3 in the same turn.. but it still doesn't feel strong enough or viable for serious builds to me. Well, not quite. Really all i have for defense though, is that: Have you tried Barnes Rogue? Thanks for your attention! Didn't try rouges at all since the expansion (Didn't craft Valeera for miracle rouge).. Mill rouge winrates are very low; Tempo rouge is mostly worse than Token Druid or Pirate Warrior, unless you have a new breaking meta build for these archtypes. Barnes Rouge hmm.. You spawn Malygos and go beserk? Not bad for Rogues at least, it can pretty reliably be a 4-mana 5/5 at least. Looks like an Arena card otherwise. How many times realistically speaking are you going to destroy your weapon before this minion gets killed? probly just once so yeah... not that good imo. Elemental Rogue? Can't imagine this in an Elemental Shaman deck. Meh overal. I just tried it out in an elemental rogue deck (it had Prince Keleseth and Plague Scientists in it too to make use of the 1/2 elementals) and it was actually pretty solid. The deck as a whole got me to rank 10 without much trouble, and this card was a nice 4-mana [often 5/5] curve play which flows into Servant of Kalimos without the usual awkwardness/situational turn 4 plays of other elemental decks. I don't see it working anywhere outside of rogue though since other classes can't destroy their own weapons conveniently.